Rate of sea level rise in the seas surrounding Antarctica since 1992. Aggregate sea level rise is indicated in black. Individual seas data is broken out by color. Image source: Nature. 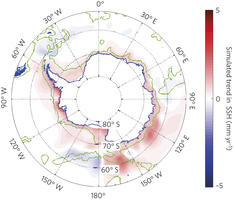 Sea level rise anomaly of the region surrounding Antarctica compared with the rest of the Southern Ocean. Red indicates faster than normal sea level rise. Blue indicates slower than normal sea level rise. Image source: Nature. 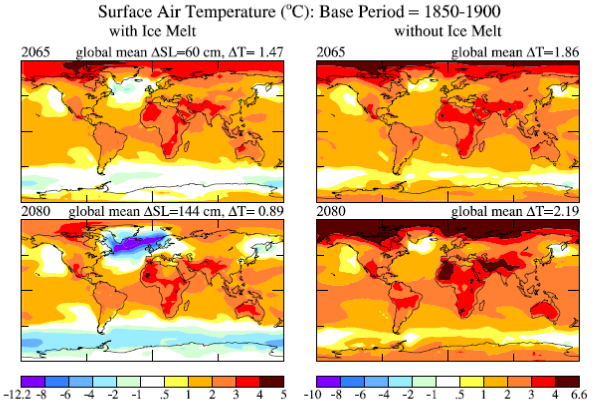 Iceberg cooling effect under a mid-range warming scenario when global climate models were set to include the effects of large freshwater outflows from polar glaciers at a fast enough rate to raise seas by 60 cm through 2060 and 144 cm through 2080 [left frames]. Note the cooler zones in the Southern Ocean and North Atlantic adjacent to Greenland. Right frames include mid range emissions/warming scenarios and IPCC projected rates of sea level rise. It is worth noting that the amplifying effects of potential additional ghg release from the global climate system, particularly from Arctic and world ocean carbon stores, are not included in these simulations. Image source: Hansen and Sato.